One of the world’s rarest species of whale, the Southern Right Whale got its name because of the nature of its personality: easy to approach, friendly, and yielding large volumes of oil… making it therefore the “right” whale to hunt! And hunted it was, almost to extinction; there may have been fewer than 2000 of these whales at the beginning of the 20th century, from the more than 100,000 that are believed to have existed before whaling began. Protected now for almost 100 years, the Southern Right Whale population is slowly recovering, with Peninsula Valdes being home to the largest breeding population in the world. 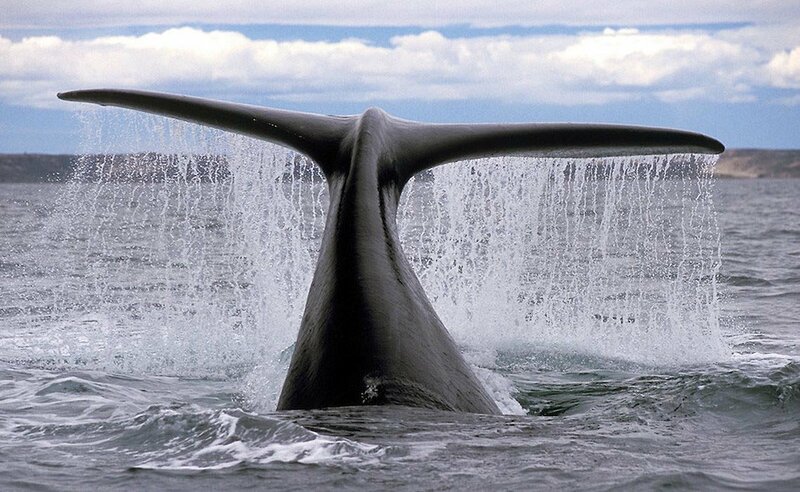 The Southern Right Whales are massive creatures, growing up to 45 feet (15 meters) and weighing up to 57 tons! We think of dinosaurs as gigantic, but this aquatic creature is around 6 times heavier than a Tyrannosaurus Rex! The head alone is one third the size of its entire body, with a “smiling” mouth that stretches from eye to eye. 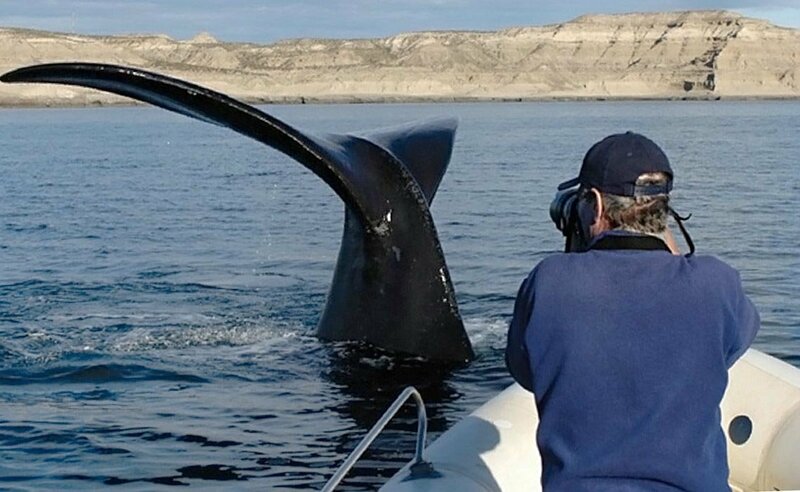 These whales are one of the more social species of whale, interacting with humans often; and they are usually on the water’s surface, which makes for a great viewing experience. It’s considered safe to approach them, and they are often rather curious about boats passing by. They are quite playful, and can be seen exhibiting unique behavior such as “sailing”: which is when they use their elevated tails to catch the wind; “lobtailing”, slapping it on the water; “headstanding,” where they rise in a vertical position with their head high above the air; and the most exciting of all: “breaching”, where the whale jumps out of the water spinning and landing with a huge and thunderous splash! 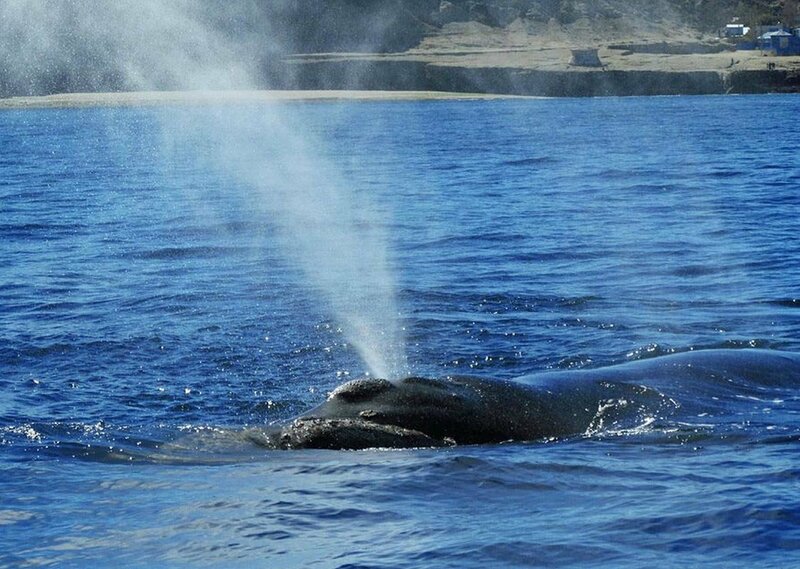 Every year from June to December the Southern Right Whales migrate to the Golfo Nuevo (New Gulf) to breed. Our boat captains are whale-watching experts, trained to make a close approach and ensure an excellent whale-watching experience without disturbing the whales. For example, the engines are turned off when whales approach, and captains avoid approaching them directly. We will spend approximately 1 hour and 30 minutes navigating, before returning to port, with a camera full of memories and the experience of witnessing one of the ocean’s most impressive creatures at play. Whale season is usually from mid-June to mid-December, but the exact whale season is defined by... the whales! If you are booked for this tour during mid-December and the tour cannot be completed because there are no whales, we’ll provide you with another navigation to see sea lions. 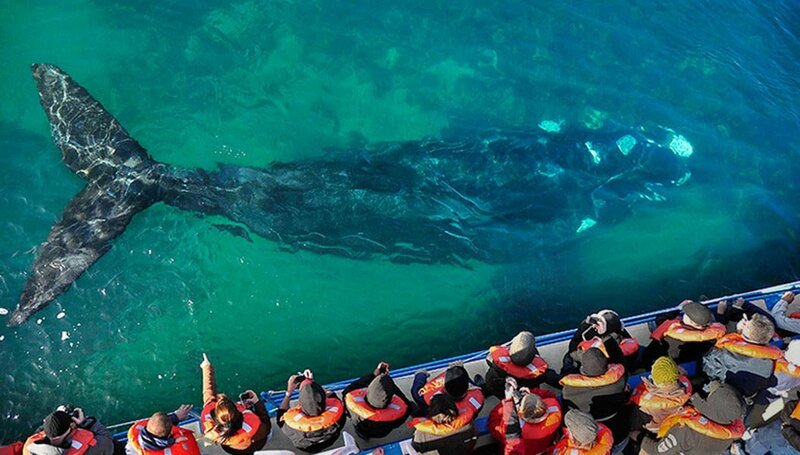 If you are booked for mid-June and the tour cannot be completed because there are no whales, we’ll refund you for this boat tour after your trip. Important: please bear in mind that, even though whales are usually spotted from close-up on this tour, it can sometimes happen that they don’t show up close, or even at all. This tour is done on the same day as the Peninsula Valdes tour. This navigation experience may be cancelled if the winds are too strong. If the tour is cancelled, you’ll receive a full refund for the cost of the tour after your trip. Duration: approximately 1 hour and 30 minutes (done during the Peninsula Valdes tour). Guide: no guide is needed for this sightseeing navigation but the boat company provides English speaking assistance. Vehicle: the boat has capacity for up to 55 to 60 travelers.